The 4th of July weekend is almost here, people will be firing up their grills or starting an open fire at their camp site. Grilled potato pockets remind me of sitting by campsite fire on a chilly summer evening (like the 60 degree weather we are having right now in Chicago). With this cooking method, and the combination of the potatoes with the garlic and herbs will create an irresistible aroma and will compliment any kind of meat you serve. I purchased fingerling potatoes at local farmer's market, you can use Yukon or baby reds too. I served these potato packets with my beer can chicken. Wash and prep the potatoes, place them in a saucepan with salt and enough water to cover them. Bring to a boil and reduce heat to medium low. Cook the potatoes until fork tender, about 8-10 minutes. Drain the potatoes. Return the potatoes to saucepan and add the olive oil, garlic and herbs. Toss the ingredients to coat evenly and season with some fresh ground pepper. Set aside to cool. Arrange squares of foil on your counter, divide the potato mixture among the foil squares. This recipe makes 6 serving but you can decide the amount of potatoes accordingly. Make sure each packet has a garlic clove. 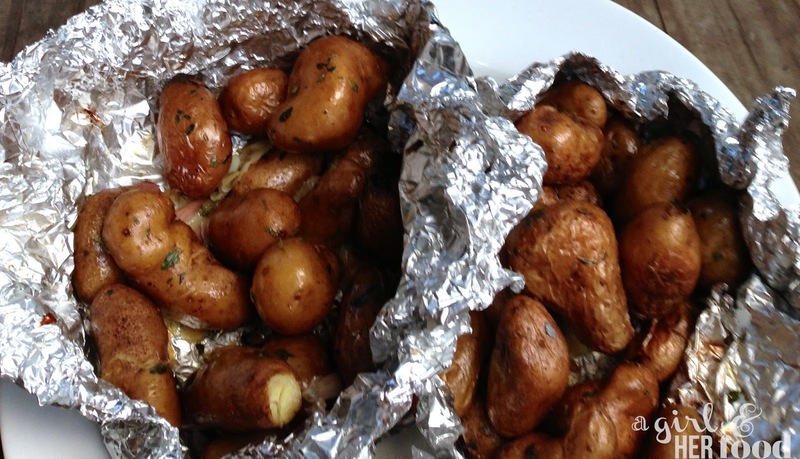 Seal the potatoes by crimping the foil together to create a packet. Place the potato packets on your pre-heated grill and cook, turning occasionally, for about 15 minutes. Be very careful transferring and opening the cooked packets they will be very hot. Transfer the packets to a plate. Pierce the foil with a fork to release that hot steam and then open packets carefully. 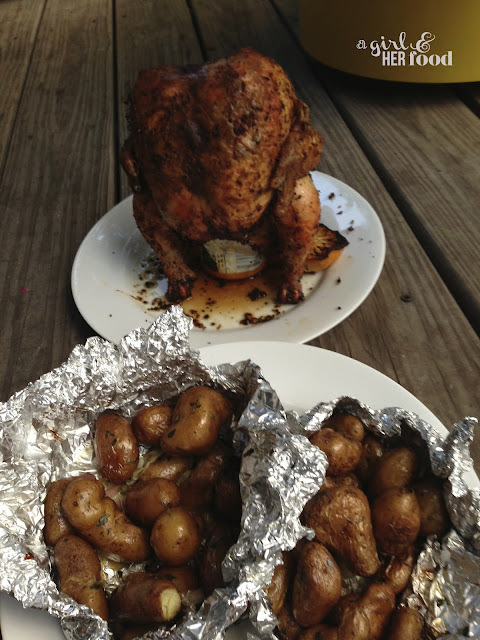 I like to serve my potatoes in the foil. Enjoy!